On your mark, get set, go! With thunderous applause and a spectacular fireworks display, athletes cross the starting line on the market square of Breuil-Cervinia. In a full sprint, the first few meters are done on foot until participants reach the base of the ski piste. From there onward, it heads uphill for the first time for a bit, nearly 2,000 meters of vert all at once. Today, just as before, the Mezzalama Trophy is a big deal not only for participants, but also spectators and organizers. But what’s it all about, this mythos of the skimo race that first took place in 1933? Ski touring came to be in 1880 just as did alpine skiing. The reason was that there was not then any difference between the two disciplines. You just had a pair of skis and bindings, and they could be used for both climbing and skiing downhill. Bindings those days were just attached at the toes with the heel remaining free to move. Today that is more similar to the telemark style as to today’s “sliding” on two boards. Ski touring was not then a particularly classic recreational activity as it is known today. It was more the means to an end, to gather wood and hay from nearby mountains and to bring it to the valley for the daily needs in winter to survive. It was not only shortly before the end of the 19th century that skiing transformed increasingly into a recreational pursuit. That created an upturn in ski mountaineering. Pioneers like Oscar Schuster were the ones who first racked up noteworthy achievements in this new sports discipline. The German doctor and alpinist climbed the 4,634-meter (15,203-foot) Dufourspitze in the Valais Alps on March 23, 1898. 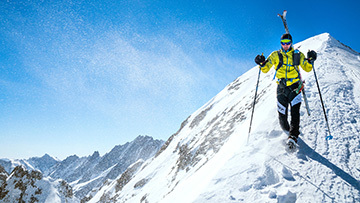 This ski tour was the first ascent of a four-thousander on skis. The history of the Mezzalama Trophy starts with the Italian mountaineer Ottorino Mazzalama, born in 1888. It was in his memory that this race was created. Ottorino Mezzalama was an outstanding skier and alpinist and today, still is seen as the pioneer of military ski mountaineering. His life ended tragically at the age of 42. In February 1931, he took part in a voluntary search-and-rescue mission at avalanche tragedy in the Rochemolles valley in which 20 soldiers went missing. 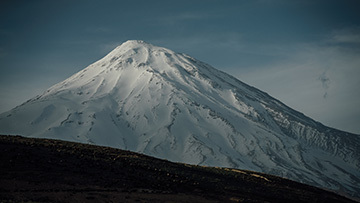 He and another colleague were surprised by a change in the weather and thus had to bivouac the following three days in a small hut. Weakened by this stress, Ottorino Mezzalama was overtaken by an avalanche on the descent and died. In his memory, named after him were the Mezzalama Glacier in the Italian Valais, the Ottorino Mezzalama Hut as part of the Italian Alpine Society, as well as the Mezzalama Trophy and the Mezzalama Skyrace. On May 28, 1933, the Mezzalama Trophy took place for the first time and was run through 1938. After a long break, the competition was restarted in 1971. In 1975, it became the official World Championships of ski mountaineering. Since 1997, the Mezzalama Trophy as we know it today has taken place every two years. This year (2019) is the 22nd time. The current course record is 4 hours, 18 minutes, 27 seconds! That was achieved by Stephane Brosse (France), Patrick Blanc (France) and Guido Giacomelli (Italy) in 2005. Francesca Martinelli (Italy), Roberta Pedranzini (Italy) and Gloriana Pellissier (Italy) hold the record for women with a time of 5 hours, 28 minutes, 36 seconds. 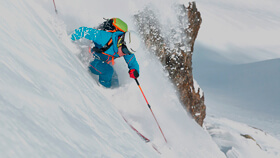 With its incredibly demanding course, the Mezzalama Trophy is among the biggest challenges for any ambitious ski mountaineer and without question is one of the highlights on the annual skimo race calendar. In teams of three, participants cross the Italian Monte Rosa massif: 45 km and 3,000 meters of vert, across razor-sharp ridges, up icy climbs and down steep descents. The biggest challenge, however, is the altitude. The course profile shows that athletes must cross up and over 4,000 meters in altitude several times. That resulted in the Mezzalama Trophy acquiring the nickname of the “highest Alpine ski mountaineering race in the world.” First contended in May 1933, the Mezzalama Trophy will take place this year for the 22nd time. What started it all off and how the race has developed over the years is what you are about to find out right there. 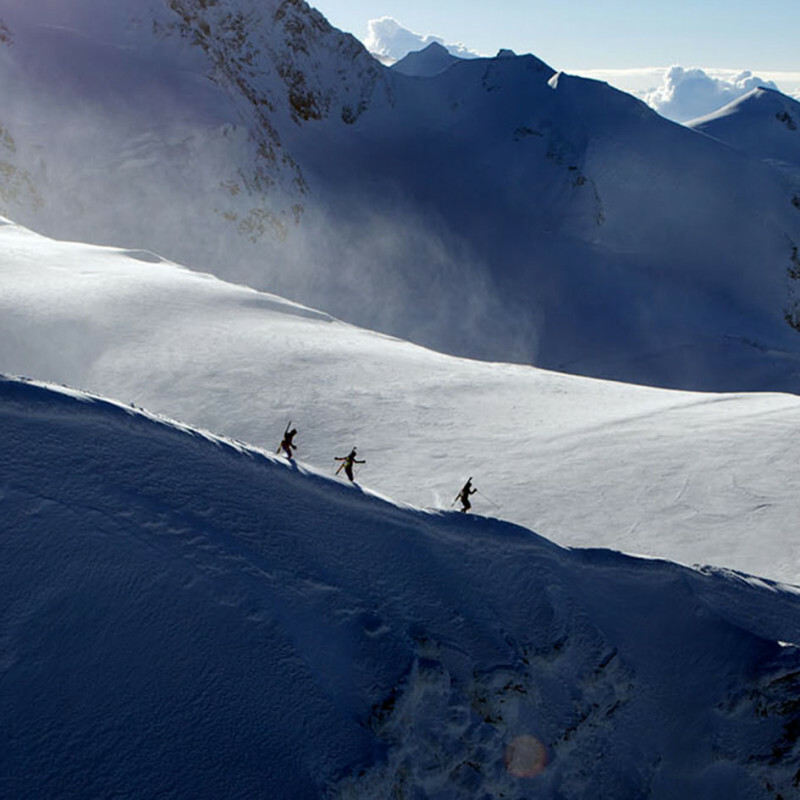 The Mezzalama Trophy course is among the most demanding skimo race courses in the world. 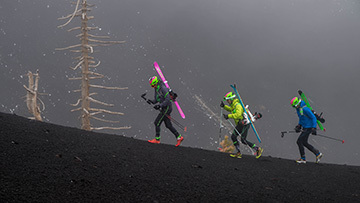 In addition to normal alpine dangers, athletes dance along the edge of 4,000 meters in altitude, crossing it several times during the race. With the stresses at this altitude, the Mezzalama Trophy is thus transformed into a true challenge for every ambitious ski mountaineer. The course can vary slightly depending on the year and snow conditions. Read the crucial 8 points for a successful Trofeo Mezzalama. --> Benedikt Böhm tells his secrets!